jimbo.info » Blog Archive » Pokémon GO: Gotta Catch ’em All! Pokémon GO: Gotta Catch ’em All! Remember Chris from the Boys Briefs blog? 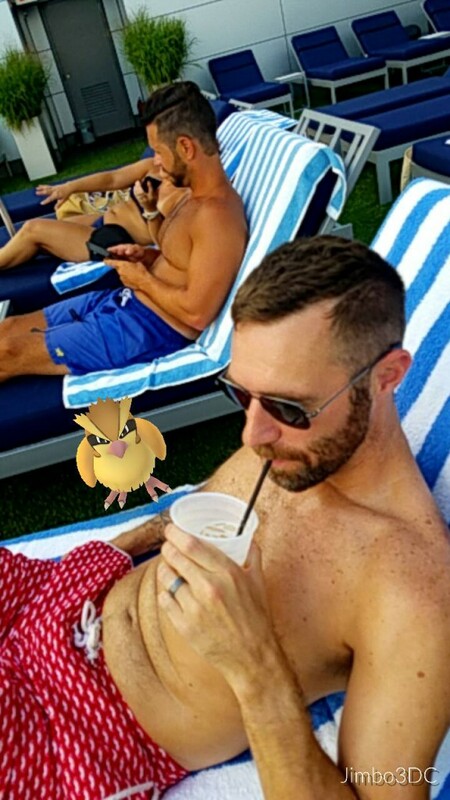 Here he is trying to attract a Pidgey Pokémon with a cocktail. Nothing has changed. Back in 1998 I was playing Pokémon Red/BlueYellow on the Gameboy. In the game you could travel to different places and catch critters, which would evolve into more powerful forms. Sort of like Dungeons & Dragons but with critters instead of swords & sorcery. You could trade your critters with other friends who had the same game. It was fun and a little addicting. Later on Pokémon Stadium came out and you could bring your critters that you found on the Gameboy and export them to the Nintendo 64 game console, then fight them against your friends and in-game opponents. It made all your collecting efforts even more fun. Then Pokémon Snap came out on the N64, where you would travel on a golf cart safari-style and take pictures of the things you saw. Better pictures with more Pokémon in your frame got you more points. Being a birdwatcher, I loved that one too. In fact the whole Pokémon concept is merely a virtual version of birdwatching as far as I’m concerned. If you haven’t seen “The Big Year” yet, it’s a fun movie about birdwatching that will also help you understand all this Pokémon business. When I heard a location-based app version of this game franchise was coming out for play on your handheld device I knew it was going to be big. The company producing the game had enjoyed success with the similar Ingress app. I never played Ingress but had a few friends who did. It encourages real travel to locations to check-in and compete against other factions. It’s clear Pokémon GO borrows a lot of concepts from Ingress. But this time you not only check-in but you collect critters along the way, just like in Pokémon Red/Blue back in the day. Busy locations have been drawing a lot of app users since the game came out. You can even plant lures that attract Pokémon to your location for easy catching. While I was fishing for Pokémon at a lure hotspot at DuPont Circle today there was a dude there cruising like it was 1998. Back in the 80s and 90s that area was a popular cruising spot where you’d also try to find your own critter to take home. But with the advent of cruising apps like Grindr and Scruff, and the shift of the gay ghettoes in the city, few find much success at DuPont Circle anymore. But just like in the 90s, this guy didn’t have a handheld device, but he also didn’t seem to know what was going on with all the people looking into their phones trying to catch Pokémon. He was trying to look for men to hit on who weren’t there, without the aid of a handheld device. Instead there were people there trying to catch imaginary creatures that weren’t there, using a handheld device. The contrast was fascinating and sad for everyone. This entry was posted by jimbo on July 10, 2016 at 11:57 pm under gay, geek, The DC. Both comments and pings are currently closed. I’m loving the game, also it’s pretty cool to see so many people out at parks and land marks playing at the same time. I can easily see the marketing appeal to any game like this! Well maybe the guy without a phone is just out of prison. The Washington Post this weekend had in the Outlook section interviews with people freed from prison for non-violent drug charges and a lot, a lot of the people just seemed perplexed by the obsession with smartphones. Prison is like being stuck in a time machine.